I have to qualify that with it has a "comfy ride" given its small hard tyres and wheels. Because its not in the same league outdoors as say a Frontier X5 or my own powerchair. Tested one and it felt like I was being vibration tested! (In comparison). And it didnt have the power with me in it to go up the steep ramp into my local pubs bar either. 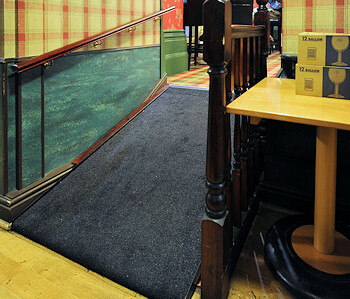 http://www.wheelchairdriver.com/images- ... 3/ramp.jpg This is one of my standard tests. Not many chairs can do this. Or turn around in the small disabled toilet either in the same pub... And theres a tight 25.5 inch wide doorway to access the resturant. In all a good example of an outdoor venue that a Wheelchair Services powerchair simply cant use. I went to wheelchair services. I had got home demo of a TDX thinking that Invacare supplied their chairs cheap and so it would be that MWD. It has to be a MWD cos of angles between my doorways indoors as the standard Spectra won't do it. So anyway I went to clinic they had booked a TDX from my driving test which was ridiculously easy! When they priced up my clinical needs it came to £7,500 the guy offered them to do Salsa MWD for around £3,800 ish, so I have to go back in 2 weeks to try that one. They have said I can still get the TDX if I want but I have to find the remaining £3,600 or thereabouts for when I go back to pay for it and they will give me the cost of the Salsa in vouchers towards it. To be honest mine will be mainly indoors chair as I have a mobility scooter I use to walk my dog which can easily get over the playing fields and carry loads of stuff back from the Asda. On the specs I got it said they were 50ah batteries?? maybe the RWD version is different? The MWD got a good review on the site I had seen it reviewed on and probably for what I'd use it for it would be fine for me. I'll wait and see when I go back but I don't see point in spending nearly £4,000 of my savings if the one they provide will do the same job as well for me. I could use the money for a standing frame as they won't fund the Genie standing chair and I can't afford difference for that either. Fair enough. You might want to read this carefully though.